One of the interesting parts of the research we've been doing on baskets and basket makers is getting to know more about the real men and women behind the baskets. Here in Grand Falls-Windsor, we've learned about basket makers like Angus Gunn and Everett Janes, and this week, we met the daughter of Mr. Alfred Menchenton. Alfred Menchenton was a name we'd come across before, and we even have one of his baskets already documented on Memorial University's Digital Archive Initiative (DAI). 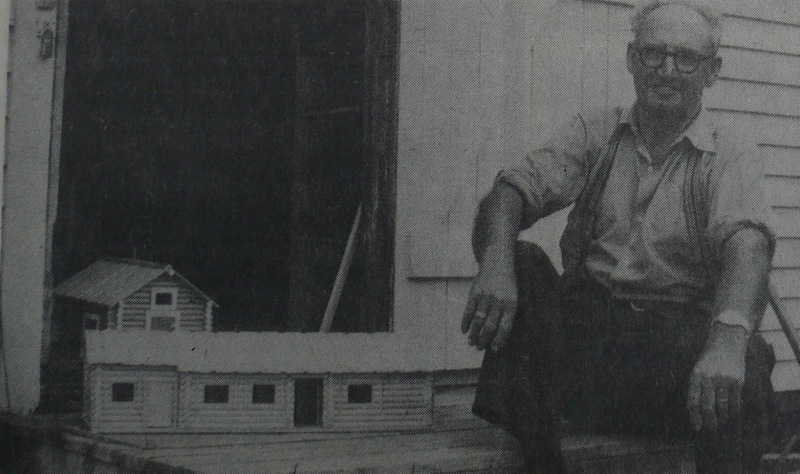 He was a jack-of-all trades: a woodsman, a carpenter, a builder of logging camps, model-maker, and a prolific crafter of lunch baskets for workers at the mill in Grand Falls. In the September/October edition of "The Rounder" for 1981, reporter Glen Fiztpatrick wrote, "Over the past couple of years, Mr. Menchenton has become an expert. He made 250 baskets last year and sold them all and could have sold more if the time was available to make them." The same reporter had found Mr. Menchenton's baskets in the Grand Falls tourist chalet, and had gone looking for the creator. He tracked him down at his shed in Norris Arm North. "He was in the process of preparing the long narrow strips of birch and pine which were hung along the walls, in readiness to be made into baskets later this winter," wrote Fitzpatrick. "His equipment included an electric table saw and an electric planer, necessities, he said, to produce the smooth strips used to construct the sides. He assembled the saw himself, building the table in which it was placed, and bought the planer second hand." Over thirty years later, Mr Menchenton is no longer with us. But his daughter and her husband drove us out to that same shed, and there, untouched, was the scene as the reporter had described it. All his tools were still in place, and pieces cut out, ready to make a new basket. Strips of wood were fixed into a form to provide the curve needed for basket ends and handles. The table saw he built was still sitting inside the door, and the walls were festooned with tools, jigs, pieces of wood, and the snowshoes he had also apparently been adept at creating. One expected Mr. Menchenton himself to walk in, and pick up his work where he had left off. Mr. Menchenton won't be about our Tea 'n' Baskets event tomorrow at the Mount Peyton Hotel in Grand Falls-Windsor, where we are inviting owners of baskets to come, show, and tell about their histories. Even though he won't be there, we are hoping some of his baskets will be.